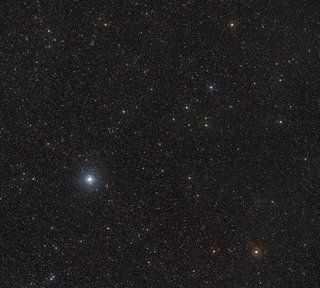 This wide-field image shows the surroundings of the red dwarf known as Barnards Star in the constellation of Ophiuchus (the Serpent-Bearer). This picture was created from material forming part of the Digitized Sky Survey 2. The centre of the image shows Barnards Star captured in three different exposures. The star is the fastest moving star in the night sky and its large apparent motion can be seen as its position changes between successive observations shown in red, yellow and blue.